In celebration of the 50th anniversary of England's Man Booker Prize, Writers & Company is airing a special summer series of Booker Prize winners from our archives. You can see all the episodes here. 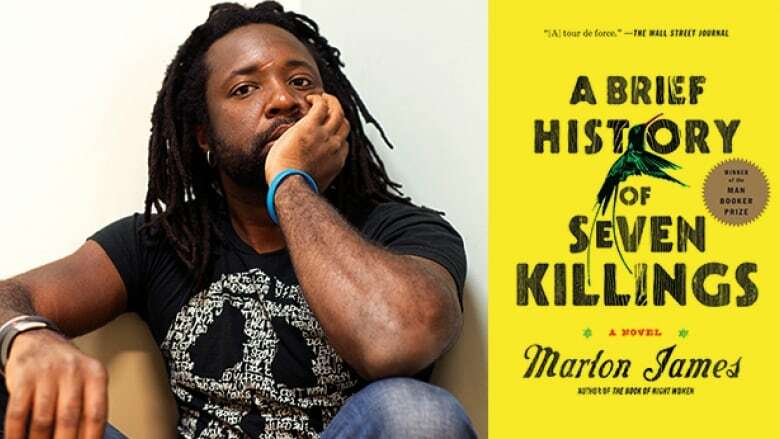 Marlon James won the 2015 Man Booker Prize, becoming the first Jamaican writer ever to win the prestigious award. His winning novel, A Brief History of Seven Killings, spans more than 30 years and a dozen narrative voices, revolving around an attempted assassination of reggae star Bob Marley. The attack on Marley's house in Kingston, Jamaica took place on December 3, 1976, two days before he was scheduled to play a Smile Jamaica concert in anticipation of the country's general election. James uses that event to explore a world of violence and corruption — not just in Jamaica but also in the United States. Marlon James talked to Eleanor Wachtel in 2015, shortly after his Man Booker win. "There is a Jamaican proverb, 'if it no go so, it go near so.' It usually means if it is not the truth it's pretty close to it. In Jamaica, we don't have a lot of history books. We tend to trust rumours. I don't trust facts and I don't trust the official version of the story. I always trust the rumour. I always say, 'If this is not the total truth, it's probably very, very close.'" "Bob Marley represented self-determination. In Jamaica at the time, the idea of poor people, the idea of ghetto people, the idea of people with no agency whatsoever thinking for themselves and making their own decisions and realizing they have a certain kind of sovereignty in deciding who should run the country, was radical and revolutionary. That was not how we were raised. We were raised to be subservient. We were raised to be subjects of the Queen. We were raised to be subjects of people who look like the Queen. So he came along, and it was a pretty radical idea that you should take charge of your own destiny and that your politicians serve you, not the other way around. "He was a revolutionary figure, but he didn't fit the mould, necessarily, of a black power person. He didn't fit the mould of an acceptable revolutionary for a lot of people. There was also the fact that he was Rastafarian and back in 1976 that was still a polarizing movement. It was a movement that faced a lot of opposition and a lot of violence. Especially since the people in the ghetto, those who suffer as a people in the streets, would have come to him first. Rich kids latched on because he became a superstar and they couldn't ignore him, but they weren't the supporters from the get-go." "Writing was the first thing I ever came across where it was its own reward. Just the fact that I wrote this sentence, or this paragraph, or this chapter, was fulfilling in a way that I didn't know you could be fulfilled. I just didn't know. The idea of writing purely for myself, and not a diary, but imagining a world and inhabiting it, was its own reward and I'd never experienced that before. And then I realized I could write myself out of one reality and into the next. Not just in terms of escapism, but in terms of this was the thing I think I did well. This was the thing I think I did better than anything else. My talents would get attention, could get a book deal, but also could get me out of Jamaica and get into the type of life that I wanted. And that's what I did. I literally wrote myself into the life that I wanted." Marlon James's comments have been edited and condensed. Music to close the show: One Love composed by Bob Marley, performed by Bob Marley and the Wailers.